This page describes how to create patch files from your local repository, how to attach them to a Crucible review and how to use Crucible's Patch Anchoring to retrieve more context from the original file. A patch file is a portion of a source code file that contains the code changes that you have made – it's a diff that shows the differences between your working copy and the base revision. A pre-commit review in Crucible allows a developer's code changes, in the form of a patch file, to be reviewed before those changes are committed to the SCM. A typical scenario is where the developer does not have write access to the repository.The developer creates the patch file and adds it to a Crucible review. Once reviewed, the patch is either committed to the repository or is sent back to the author. By default, patch files will only show a few lines of code surrounding each change, rather than the entire file and its changes. Patch anchoring overcomes this limitation. Select a parent folder, sub-folder or file that you have altered, in the Project tool window. 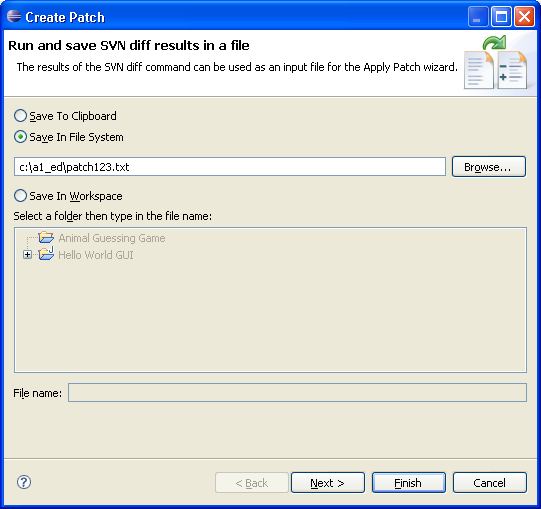 Click Create Patch, choose a location to save the patch file to, and click OK.
1. Select a parent folder, sub-folder or file that you have altered in the Project tool window, right-click it and choose Local History > Show History. 2. 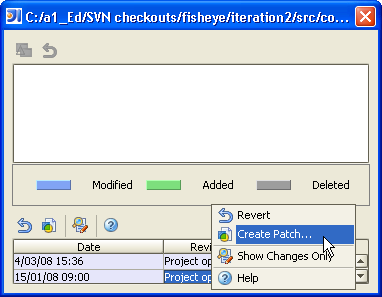 In the Local History view, right-click the revision number, and choose Create Patch. 3. In the Create Patch dialog, choose a location for the patch file and a file name, then click OK.
Find the parent folder, sub-folder or file that you have altered, right-click it and choose Team > Create Patch. Create patches yourself, directly from the SCM, using the following commands, where patch.txt represents your name for the new patch file. Then you can use the dedicated Crucible Review CLI tool to create reviews for your patches and commits, directly from your terminal. See Creating reviews from the command line. Creates a patch file with around three lines of code, before and after each change. Revision information is included by default, so if you have Fisheye, you may be able to anchor the patch to get full context. Creates a patch file that shows all code in the file. 10000 refers to the number of code lines before and after each change that are included in the patch. svn diff does not print any information about files copied in the workspace. The built-in diff feature in svn diff does not support specifying lines of context, so you must tell Subversion to use an external diff command. The second diff in the command needs to be the name of your external diff command. You might need to specify the full path to that command, such as /usr/bin/diff. On the Windows platform, you may need a Unix-like emulator such as Cygwin, and install the optional diff command for that. The -dcu option provides a combination of "context format" and "unified format". It provides the diff in a standard unified diff format (which we need to parse the diff) as well as revision information (which we need to anchor to Fisheye). Later versions of Perforce do not support -dcu, so -z tag should be used instead. Example of using GNU diff to append files individually to the patch in UNIX. Since Perforce diffs do not include added and deleted files, you should use p4 opened to find such files. 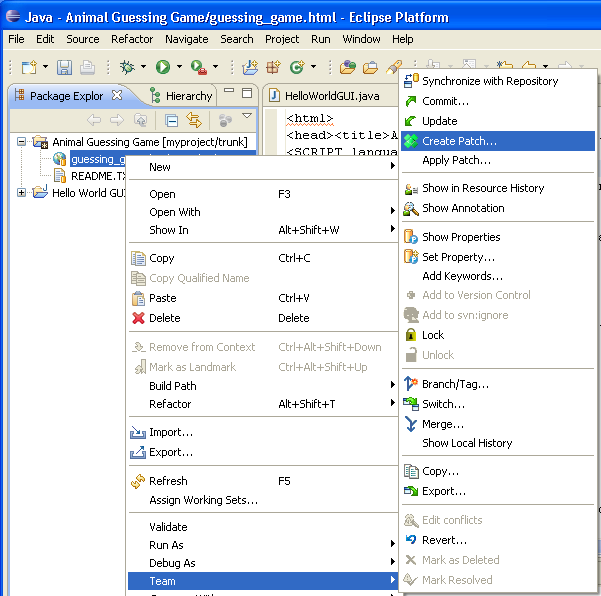 Replace path_to_added_file with the actual path of your added file. You can follow a similar procedure with deleted files using p4 print to extract the previous version of the file. 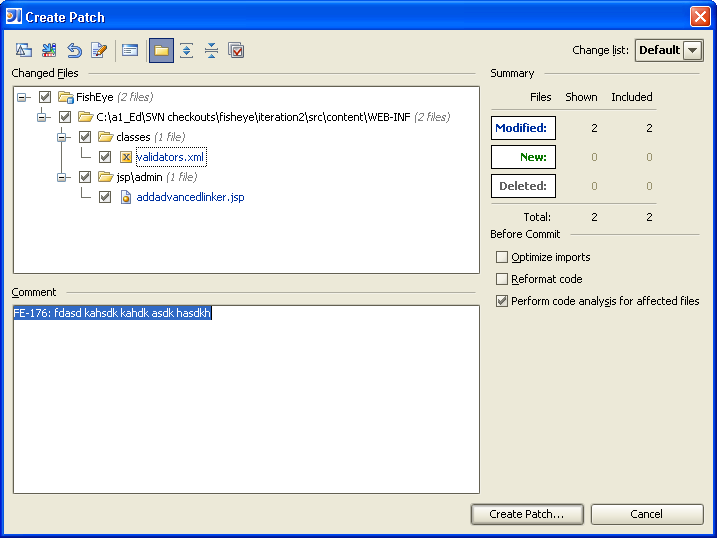 Perforce does not directly support creating patches that include all lines of code. A workaround is to check out 'before' and 'after' versions of the file, and use GNU Diff to create a patch between the two files. That file could then be loaded into a Crucible review. If you use Git-style diffs (--git), the revision information will not be provided. This means that Crucible won't be able to directly find a revision to anchor to and will try to anchor to the newest revision on the main branch instead. 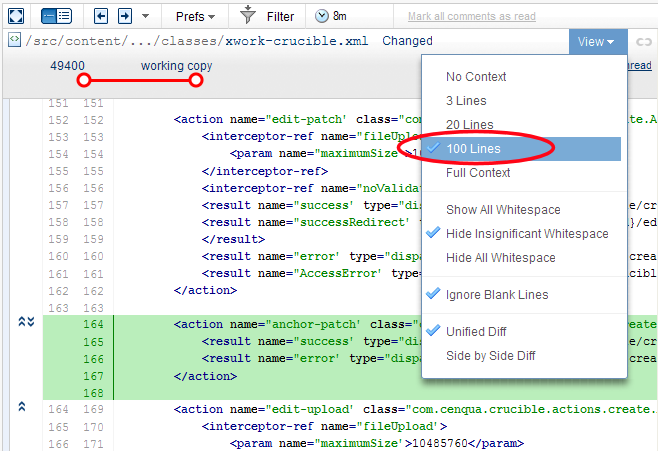 Crucible's Patch Anchoring feature allows you to add a regular patch (showing only a few lines of context) to a review. Then, Crucible will automatically search for the relevant file content in the connected repositories. When it finds the files, it will seamlessly add in more context from the files so that you can view all of the lines of code (greatly enhancing the review process). Click Create review in the Crucible header. Click Pre-commit. In the dialog that appears, click Choose File to locate your file, then Upload. Crucible will now search for matches in the files in its database. Crucible will analyze all the paths in the patch, find the branches containing all those paths, then anchor the patch to the trunk or the branch with the most recent commit activity. Crucible makes a 'best guess' in its processing – you should check that it has anchored the patch to the correct location in your repository. When you start the review, and view a diff, you will be able to choose more than three lines of context from the View menu.